When the Allied Forces came ashore in the Normandy region of France on June 6th, 1944, they freed French citizens from occupation by Germany – but the battle to do so was not without its costs, both in human lives and in the obliteration of towns along the coast. The magnitude of the destruction was jaw-dropping, with entire blocks reduced to gigantic piles of rubble. 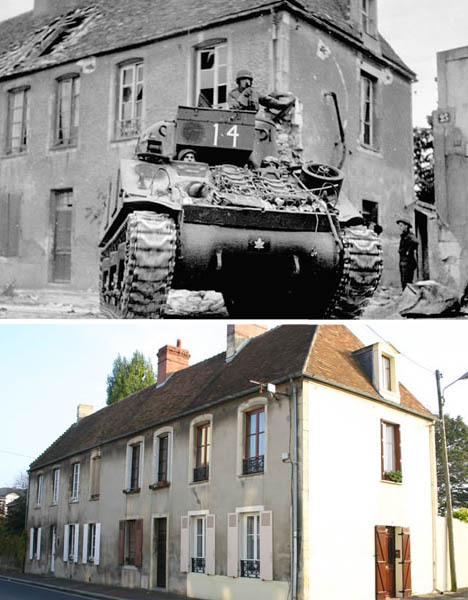 Amazingly, many of those buildings were recreated down to the last detail and stand today as if frozen in time – a monument to life as it was in Normandy before the invasion. 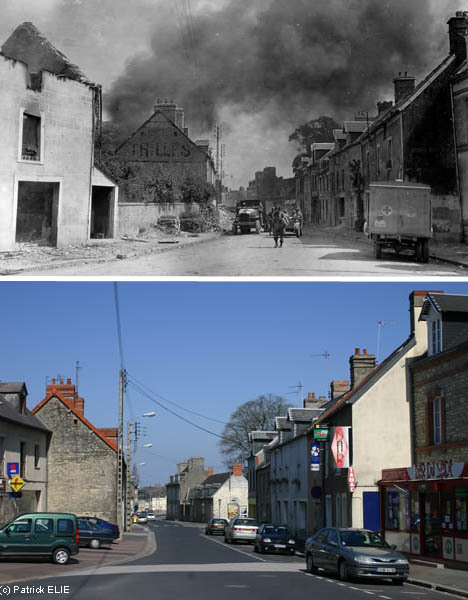 In a documentary photography series entitled ‘Normandy 1944 – Then and Now’, Normandy historian Patrick Elie juxtaposes shocking images of war with cheerful photographs of the same locations during modern times. Elie, who has devoted his life to chronicling D-Day and the effects of the war on his home country of France, worked tirelessly to find the exact locations of dramatic photographs from 1944 and then took his own photos of the modern-day sites. 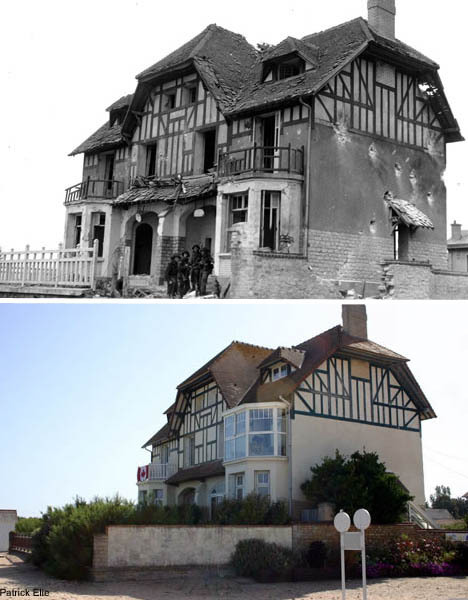 The images include places like Bernieres-sur-Mer, where a French Canadian infantry unit came ashore as part of Operation Overlord, and Caen, where heavy fighting destroyed much of the town. 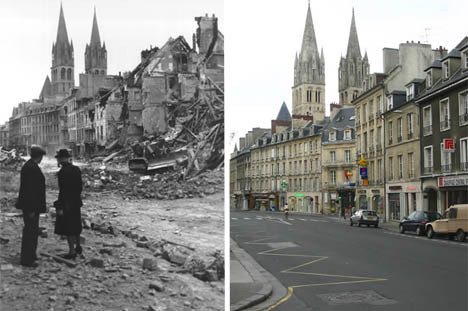 It took 14 years to rebuild Caen after the extensive damage incurred, and though many buildings were restored as closely to their original appearance as possible, the city has a distinctly ‘new’ feeling compared to the rest of the area. In Elie’s work, some viewers may see haunting reminders of the horrors of which we are capable, while others may see the resilience of the human spirit. 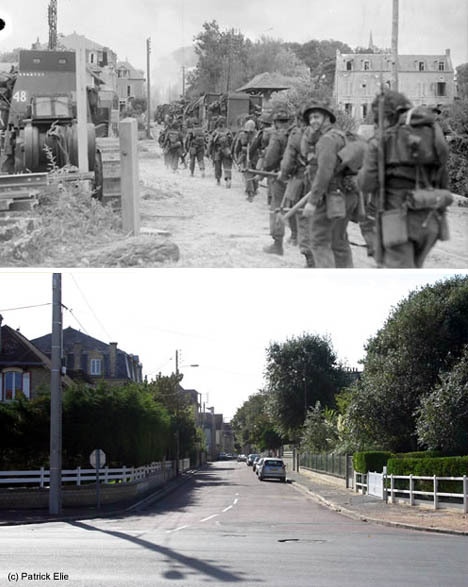 Either way, the contrasts – and indeed, more often, the similarities – between the photos from such vastly different eras provide an emotional connection to the events of World War II and D-Day some 65 years later.